← Oh, for a cup of tea! The next Hypermarket was in Bristol, meant that additional Plant was required to cope with the work. Cat D8H tractors c/w 463G and 435F towed scrapers, were purchased, larger Low Loaders were required to transport the ever increasing fleet. D8H 68a 5107 turned out to be the last machine that was purchased by my father and me as a team. I learnt an awful lot from my father, a very hard but honest man, who commanded and deserved the respect that he was given. Portishead Power Station. A place of hard work and happy memories. I ran the Bristol Contract, securing and completing a large Land Reclamation Project for the C.E.G.B. (now Powergen) in Portishead, whilst in the area, then works in the Portbury Docks. The works ran for 9 months, I lived in a Mobile Home on site, working 14 hours a day, with every second weekend off, holiday traffic in the summer meant a 4am Saturday start and 8am finish to maintain programme. We had 3 Cat D8`s, 3 Komatsu D65`s, 2 Cat 977`s, 2 Cat 225`s, Cat 215 2 Volvo Dumptrucks on site with 14 Maggies hauling off site. My eldest Son, Mark, in front of one of our earlier low loaders. During my time in the South West good friendship was formed with Dave Cripps the product support representative from Caterpillar dealer Bowmaker (Plant) Ltd, Highbridge Depot prior to its takeover by Finning in 1983. The first time that I met Dave was one evening when I was under a Maggie carrying out repairs or maintenance, as was usual. He did not know who I was; in his broad Somerset accent he asked “Is the boss about?” I asked “who wanted to know?” Dave replied “I`ll have a bet that he is at home, having a large Scotch, whilst you are under there getting covered in s–t!” I crawled out, he was right, I was covered in s–t, the look on his face was one to behold, one that I will never forget, he did not know what to say or do when he realised to whom he had been speaking. For the duration of the contract Dave was great in his role of Product Support. He was later transferred to the Cannock Branch where our friendship was rekindled, we had many trips to Malaga and Belgium, Dave knew exactly how to combine business with pleasure never applying excessive pressure thus becoming a nuisance. This remained the way until his sad passing.The target we aimed for was 200 loads per day off site on week days, 100 loads off site on Saturdays, we imported and laid upto 1,200 tonnes of stone per day for site capping, we did all the excavation works for foundations, drainage and landscaping. A massive project on a very tight programme successfully completed. 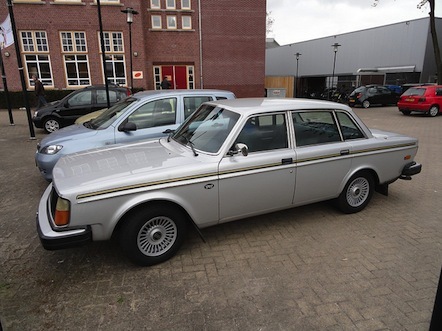 A Volvo 244 Jubilee…not too dissimilar to the one I purchased. Once the Bristol contract had been completed my car, a Toyota 2000, had just about run out; the time that it was used on site was clearly evident, scratches and scrapes, a dent in the bonnet, damage to the boot from carrying tools and spare wheels. I liked the look of the new Volvo; I decided to try to purchase a 244 Jubilee model, so along I went to Brooklands in Birmingham to see if a deal could be struck, I viewed and liked the new car, so I rather cheekily asked if they would take my car in part exchange? Sat opposite me looking over my shoulder to the window behind me, the salesman saw the car in front of my battered Toyota, asking if that was my car outside, I replied that it was. I was very surprised at how anxious he was to take a look at what he thought was my car. We walked out to where a line of cars were parked; he went to the car in front of mine, a very nice Jaguar, he, asked how much I wanted for it? The disappointment on his face was clearly visible when I informed him that my car was the one behind the Jag, hurriedly he offered me £250:00 take it or leave it, I hastily accepted his generous offer, shaking his hand on a very good deal. This entry was posted in Demolition, Family Business, Friendships, Industrial Demolition, Power Stations. Bookmark the permalink.